My son could always tell his daddy anything. No matter what the subject, no matter what the tone or the gravity, Cole Pittman could tell me. He could share his dreams without conceit; unburden his failings without fear. Cole and I were tighter than most boys and their daddies; bonded, really, more than twins in the womb. “Me and my dad, I figure there is no other father and son in the United States closer than me and my dad,” Cole once told a television reporter before catching himself. “You know, nobody in the world.”. Growing up a son in my house in northwestern Louisiana meant participating in a common practice called Dead Man’s Talk. Sprung out of the necessity of men-will-be-men frankness at a deer-hunting lease in nearby Minden, Louisiana years ago, it was the ultimate in unvarnished no-tell confession. My friends and I would hunt all day and then gather in the small, simple huts at night to lay bare our souls and consciences, with no bag limit on the truth. We told of practical jokes we had played or how one of us had won a chili cookoff using dog food. We talked about whatever we wanted, or needed, to say. There was only one catch: What we saw, what we heard – the names, dates, places and times — stayed there. I figured I could use this concept for child-rearing when my oldest son was 7 and my youngest boy, Chase, was 3 because it fit my one unwavering desire of parenthood — to be the kind of daddy I always wanted to have. Under the rules, Cole and Chase could tell me anything and everything. I could have all the reaction of a dead man. What they told me could spark no spasms of anger, no lectures of right and wrong. There could be no reprisals. I could only listen and learn. We shared most everything. Some of it made a father’s heart swell with pride; some made it drop through his stomach. I heard some things I didn’t want to hear, and every bit of what I needed to hear. Just as importantly, I told them things I’d never told anybody, the kind of things my father would never have shared with me. I had loved my daddy, but he would never tell him me what my boys were telling me, never even think it. Our relationship was fabricated out of my simple desire to get a small nod, or that vague look of satisfaction that I saw in my father’s eyes even if nobody else did. Edward Pittman was a barrel-chested, 5-foot-10, 220-pound powerhouse who worked seven days a week as a farmer and millwright, didn’t drink, smoked a pipe and remains to this day the only man every to knock me unconscious, which he did twice. We were as poor as the dusty early 19th Century military supply road that ran by our farm. We raised what we ate and my 15 brothers and sisters and I slept three to a bed in a small white frame house with a tin roof. When my dad needed something of me, his middle son, I didn’t hesitate. At my daddy’s bidding I dug wells by hand in the hard red clay, worked my end of a crosscut saw all day with no relief and tore down wasp nests with my bare hands. I got stung so many times that I learned to hold a wasp in my hands and laugh as it stabbed me. Sometimes I got that nod. I wanted my boys to get much more. And so my sons and I had Dead Man’s Talk about the grave and the trivial. We whispered as we cradled rifles high in a deer stand or joked as we tooled around in the pickup truck or ate shrimp and spaghetti at Cole’s favorite Italian restaurant. We shared our triumphs and embarrassments while lifting weights in a steamy gym and in the cool night air of the deck behind our Shreveport town home. 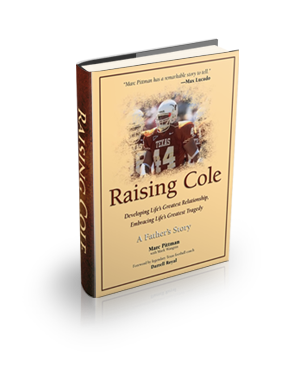 As Cole grew from a peewee soccer star to a college football lineman at the University of Texas we talked more often and covered more territory. I wanted nothing left unsaid. Nothing. Once one of Cole’s high school coaches, rankled that I may have had a too-perfect view of my son, pointedly suggested there were things I didn’t know about his involvement in another boy’s misdeeds. “Oh, you talking about how he had dared the boy to shoplift?” I said. There now came a time for Cole to help me understand something I couldn’t begin to grasp, to help me find the words to explain what I couldn’t possibly fathom. On this night I laid down next to my son, pen and pad at the ready. It was my turn to unburden. In a few hours a man who only a few years earlier had gotten the sweats just at the thought of being called upon to pray in a small Bible study would be addressing several thousand people who would be hanging on his every word. I never needed my son’s help more. Though I had brought along a pillow and blanket, I had no intention of sleeping. We talked through the night, through the cloud-shrouded dawn, through the rainy early morning. At 10 a.m. I finally left, to wash up, to take a deep breath, to put on a white shirt, dark jacket and khaki slacks. I’m 50 years old. I am a millwright and a construction worker. My entire life I have been a man who worked with his hands fixing things. If a house needed a new roof I shingled it. If a room needed to be enlarged I knocked out a wall and added on. If a support beam was sagging I shored it up. Over and over again I fixed what was broken and changed what I couldn’t fix, from cracked panes of glass to the way I approached and lived my life. That’s what I was good at. That’s what I did. On the morning of Feb. 26, 2001 God gave me something I couldn’t fix or change. My son, a junior defensive tackle at the University of Texas, fell asleep behind the wheel of his 1997 red Chevrolet pickup truck while returning for the first day of spring football practice. Sometime around 7:30 a.m., his truck veered off Highway 79, hit a guardrail, flipped and landed upside down in a brush-covered creek bed. I pray he died instantly. People are always asking me how I’m doing, how I’m handling the grief of losing my boy. The truth is that we do not pay much attention to our soul. Neither do we pay much attention to our fingers, our hands or our eyes until they are bruised or battered. Then that part of our physical being becomes important. When you bury your son, your soul is bruised. God is the only source of comfort to ease that pain. That is why I embrace the pain, because God shows up and helps me through it. I’ve buried my father, my mother, cousins and a niece. I watched my sister die from a two-year struggle with breast cancer. I found my nephew in a field, dead of a shotgun wound to the head. Add up all that pain, multiply it by a billion, and it wouldn’t scratch the surface of losing Cole Pittman. The people who ask mean well, I know. It’s not always what you say to comfort someone, it’s just the fact you’re saying something. They try to understand, but they can’t, just as I can’t understand what it’s like for any other father who has lost his son. Every relationship is different, every loss unique. I can only tell you how I tried to handle it. How we handle pain determines whom we become. For me there was only one approach – meet the pain head on. Don’t duck it. Embrace it. Drown in it. Let it smother you until you can smother it. Coping with death, to me, is all about remembering love. I don’t worry about the pain. I’ll worry if I ever stop feeling the pain. I was blessed to have a son like Cole and I’m doubly blessed that Cole can continue to touch people even in death. After he died I got hundreds of letters, phone calls and e-mails, most of them from people I didn’t know. Somehow, some way, they had heard of our story. President George W. Bush sent a note. The chancellor of the University of Texas’ fiercest rival, Texas A&M, sent his condolences. Notre Dame sent a card signed by the entire football team. Many of the responses came from people from all walks of life, who had heard our story from friends or read newspaper articles about Cole. They weren’t football fans, had no ties to the University of Texas and had only one common bond – they, too, wanted to build better relationships with their loved ones. There was a woman doctor in Houston, a single parent who wrote that she pasted the Prayer of Jabez on her refrigerator after reading a newspaper story that talked of its importance in our relationship. There was a woman who was in the San Diego airport the morning after Cole’s last game in the Holiday Bowl and saw a young man playing with some little kids while his teammates slept. There was the preacher in Kansas City, who sent me a basket of breads and jellies along with a note that said for months after I visited his church he still got requests for copies of the tape of my remarks there. People always tell me one other thing, after they ask how I’m doing. They tell me what a special bond I had with Cole, how it’s touched them and made them work harder to have the same relationship with their children. They tell me I was lucky. Maybe I was, but I worked at it too. Those people want me to tell them how we got so close. They want to know how I could convince my boys to tell me everything; how our love would be so without compromise that they would think nothing of kissing me on the mouth in front of 83,000 people or holding hands in our truck as we drove around town. We did Dead Man’s Talk because I didn’t want the emptiness and silence I had with my father. When my boys buried me I didn’t want them to feel that anything was left unsaid. I wanted a relationship with honesty and trust. With work, we were able to build that. Anybody, if willing to work at it, can do it too, and not just with sons but with daughters and brothers and sisters and parents and anybody else they want to pull closer. We fought what we called Love Wars, where a spoken “I love you” was answered with a salvo of “I love you more” and escalated from there. We were always trying to outdo each other in showing our love, not only by words but also by actions and sacrifices. It’s an approach that can work in any human relationship and it brings peace and satisfaction I can’t even begin to describe. I never wanted to win the war, but I sure couldn’t stand to lose it. We listened. Many a time my sons recalled a lesson I had taught them long before, when I didn’t think they were paying attention. I learned how important it was to mean what you say and say what you mean, and how relationships are built like houses. No building, no matter how well constructed, will stand without a solid, well-laid foundation. Honesty was our concrete; openness and trust our rebar. Relationships don’t just happen. They’re built. The foundation of my relationship with my father was made of fear and respect. Neither love nor affection ever figured in the mixture. That’s like trying to mix a good load of concrete without sand or gravel. My father never told me that he loved me, never showed me any affection except the occasional pat on the head. God, how I wished I would have heard him say it just once. Often I hear people talk about how they don’t get close to their kids because they never had a father to learn from. You don’t need a father to learn from. All you need is a heart, a resolve and one simple guideline – be the father you always wanted to have. I am blessed in that I have another son, Chase, and we have gotten as close or closer than Cole and I were. Ten months after Cole’s death, Chase followed his brother to the University of Texas. He lockers one cubicle away from where his brother did, plays the same position Cole did as a freshman, and drives the same road that took him to his death every time he makes a trip home. He hugs the pain in the same eyes-wide, chin-up, chugging-life-at-110-miles-per-hour embrace that I do. Forgetting the pain would mean forgetting my son. Cole Pittman lives as long as he’s not forgotten. I want as many people to remember him for as long they live. Call me selfish. I want him to live forever. My mother always said I was unkillable. She might have had something there. In my life I’ve survived being hit by a van and having a two-hundred-fifty-pound scaffolding fall five stories down an elevator shaft on top of me. I’ve wrestled bears and swam to within staredown distance of a twelve-foot alligator. I probably should have been killed many times over now. It sure wasn’t for lack of trying. When my father died of liver cancer I lost my only reason for living. He was my hero, my role model. He gave me my only feeling of self worth. Without anything else even resembling a healthy relationship in my life, there was no love worth treasuring. After he passed away I would go to his grave just to be close to him. I felt he was still someone who could intercede for me here on earth. I felt I could get his strength, his wisdom. He would point me in the right direction. He would watch over me. Around me, life went on. People expressed their sorrow, but they moved on. They couldn’t understand how I felt, what I had lost. Truth be told, I couldn’t understand it either. As you can tell, I’d gotten pretty good at feeling sorry for myself. My temper was equipped with a hair trigger and my solution to every affront was to fight. I don’t know how many times I defended the honor of a woman who I didn’t know, just for a chance to mix it up. Sometimes a guy would up the ante and pull a handgun on me, waving it in my face and trying to get me to back down. I tried to stare him down the way my daddy used to stare down dogs. If that didn’t work, I’d just laugh like a lunatic and slap the gun out of his hands. I’d do crazy things. Randy Reagan, my running buddy, and I would drive up behind a lumber truck, the grill of my truck almost nudging its bumper. My friend would crawl over the hood and leap on the back of the truck. Once aboard, he’d get the chain saw that was always strapped near the back, carry it over the logs to the cab, crawl over it and deposit the chain saw on the front hood. Then he’d run back, jump back in the truck, tell me about the stunned look on the driver’s face. We’d have a good laugh. Early one morning, after a night of rolling dice, we took a ’58 Chevy truck and took turns running up the railings on the side of a bridge trying to flip the truck for no better reason than to see if we could. Another time, totally sober but no less numb, I figured the solution to unclogging a three-foot pipe filled with wood pulp residue was to cut it open with a Skil saw. When I made the first cut, water spewed out and soon I was standing knee deep in water operating an electric saw. I burned out three saws cutting that pipe, but the cord never hit the water. I knew I could be electrocuted. I heard people call me an idiot. I just laughed. I had made the biggest discovery of my life . . . to that point. I had found the ultimate high. It wasn’t the alcohol, and I’ve never taken drugs. The high was to be absolutely fearless of death. Live, die – it didn’t matter. The closer I came to dying, the bigger the high. Why I didn’t die I’ll never know. Part of me certainly wanted to. Deep down, though, I felt that I had some deep, indescribable feeling that I wasn’t supposed to die. Destiny had other plans for me. I would be a father. Hunting was always part of my life and I treasured the time I spent with my buddies at an isolated lease outside Minden. During the day we’d sit high in stands and take turns trying to bag a big buck, or we’d hunt squirrels or whatever was in season. At night, the days’ kill dressed and dinner finished, we’d kick back around a blazing campfire and shoot the bull. The place wasn’t anything fancy. We’d managed to get a concrete truck back there and pour a twenty-five-foot square foundation, on which we put up a very rustic wood cabin. There were cabinets on one end and a set of French doors, which I’d salvaged from a fire job, that led to a wooden deck out back. We got a bricklayer to come in and build us a fireplace at one end and a pit out on the deck where we could cook and grill. We’d sleep in an old construction trailer in which we’d crammed eight or ten bunk beds and with whatever furniture we could find. Water came from a gravity-fed thousand-gallon tank up on a wood frame. Out to one side we had a skinning rack so we could dress any game we took right there. We built a small corral for the four-wheelers, not to keep them from jumping out but to keep thieves from jumping in. The power came from a generator and some solar panels. There were some luxuries – air conditioning and a television – but mostly it was a place to get away. It didn’t look like much, but I’ll tell you one of the greatest joys of being a father, one of the greatest tools for getting close to your children, originated right there at that hunting lease. When the day’s hunting was done, when the days’ kills were dressed, when dinner was a memory and some of our number were enjoying a cold one, we sat around the campfire and talked. Now we were leveling our sights on quarry no less elusive that what we had hunted that day. The truth, plain and unvarnished. My friends Mike and Pat Woodard introduced a concept they’d picked up from a friend. They called it Dead Man’s Talk, and simply put it was a no-tell confession. The name came from the notion that it was like talking to a dead man. A dead man couldn’t repeat what was said. It would not make him angry or stick in his craw. It wouldn’t change an opinion or influence a friendship. It would be said and it would disappear forever like a breath on a cold night. Now these confessions didn’t have to be anything big or scandalous. It didn’t have to be something that we did or didn’t do. It could just be something of which we were ashamed or secretly proud. Maybe it was something like winning a local chili cookoff using Alpo dog food and chili powder. I’m not saying that was a product of Dead Man’s Talk, because in order to be part of those discussions you would be bound by the rules. It could also be something as silly as putting a beer can on the local Baptist Minister of Music’s car hood and hiding around the corner. Or addressing him by name as he picked up the can and snapping a picture of him when he looked up. Or threatening to send the picture to the local church board if he didn’t feed us. Now I’m not saying that was a product of Dead Man’s Talk, either. You understand I can’t. What I will say is that I wish I’d taken two pictures because he cooked pretty well. Along the way I came to realize this wasn’t just a way to unburden or get a few laughs. By sharing these stories we opened up areas in our lives that we hadn’t shared with anybody. Knowing something about a buddy that nobody else knows, not even his wife or parents or kids, brings you closer to them. You know you share something special. It sounded to me like the perfect relationship between father and son. Cole was seven and Chase was three when I introduced the concept of Dead Man’s Talk to them. I explained it just the way Mike had explained it to us at the lease. I told them they could tell me anything. That could mean anything they were doing or thinking of doing, anything their friends were doing or thinking of doing. Whatever they told me would stay with me. No matter how much I might want to punish them for it, I couldn’t. No matter how much I wanted to lecture them, I wouldn’t. That didn’t mean I wouldn’t explain the consequences of their actions or intended actions, or remember it and maybe use it to shape what I would teach them or how I’d try to influence them later. But I made certain they understood that what they told me during Dead Man’s Talk only I would ever hear. I promised them that on my life. The day is February 24, 2001. If you were going to spend two final days with someone you loved, how would you spend them? The first week of January 2001, I was sitting in the First Assembly of God in Shreveport listening to Pastor Denny Duron preach about the Prayer of Jabez. It was so simple, yet so direct, it captured my soul. I began to get up every morning at five o’clock, hit my knees and recited the Prayer of Jabez from 1 Chronicles 4:10 over my son. At first it gnawed at me. When I said the prayer each morning was I saying it as a selfish prayer? Was that what I was doing? As I thought about it one morning, I suddenly wanted to read the Bible but couldn’t find my reading glasses. I knew there was a pair in Judy’s office in the house, so I went there to get them, all the while chewing it over. Would my son be glorified? Or would God be glorified? I wanted an answer. As I passed the laundry area I saw a book sitting on the dryer. Believe it or not, it was “The Prayer of Jabez” by Bruce H. Wilkinson, the best-selling author. When I finished reading it, I understood I wasn’t being selfish. I was asking God to bless my son. On February 24, a typical Saturday morning at our lakefront town home, I rose at 4 a.m. to say the Prayer of Jabez and read the Bible.. Then I headed to the driveway to get the morning newspaper. Much to my surprise and joy there sat a red Chevy truck in the driveway, with Cole asleep behind the wheel. He had driven all night from Austin, getting in at two-thirty in the morning. Knowing that if he came in it he would wake me up and I wouldn’t go back to sleep, he roughed it in the truck. I was so excited to see him, I dragged him out of the truck, covered him with kisses and dragged him into the house to Mama. After Judy added her kisses on top of mine, we put him in our bed, told him to catch some sleep and we would talk when he got up. When he did we just sat around and talked most of the day. Cole decided he’d go to a Mardi Gras party in town with a few of his friends. There was something different about Cole this weekend. I mean, he glowed he was so radiant. I had never seen him this happy and I hadn’t seen him this big. He was huge. His trapezius muscles seemed to start almost beneath his ears and ran out over his shoulders, swallowing any evidence of a neck. His chest was much larger than I had ever seen it, but he was still pretty cut. I had never seen his arms this big. You could see the confidence in the way he walked. But most important of all, I could tell Cole was starting to like who he was. On most nights when our boys went out, Judy or I would wait up until they came in. Chase’s curfew was midnight, but with Cole being there and us trusting him so much, we went on to bed. Sunday morning we went to church. Cole stood beside me, wearing one of my shirts and a pair of Chase’s pants because he had not brought any church clothes. My best friend Ken Meeks came up from behind us and told my boy, “Well, Cole, you’ve always wanted to be bigger than your Daddy. You have arrived. You make your daddy look like a pencil neck basketball player.”. I pretended I was hurt but I was swelling with pride. Both boys lived for the day that they would be bigger than me. The two things you would never see me get truly upset about they were that one day my boys would get bigger than me and that they would ultimately win the Love Wars. Cole had brought his radiant joy to church with him. Several people picked up on it. Coach Dennis Dunn’s wife Melanie went home after church and called her husband, who was out of town. “You should have seen Cole today, he looks unbelievable,” she remembered telling him. The plan was for us to have lunch together, hug and kiss and love each other, then send Cole on his way back to Austin by three o’clock that afternoon. Spring football was scheduled to start that Monday morning with a ten o’clock meeting and Cole wanted to make a great impression on his first day as a full-time defensive tackle. I was surprised when he came and asked me, “Dad, would you mind too much if I spent the rest of the afternoon with you and just left when you get up in the morning? I’ll have plenty of time.”. Frankly, I was glad to have him stay. I certainly wasn’t looking forward to him going back, then or later. He and I went out and got in the Jeep Wrangler, took the top off of it and just starting riding around, holding hands and talking. We rode around and looked at some properties that I thought might be good investments. I told him my dreams and he told me his. To me this was one of the best afternoons that I had ever spent with Cole, just visiting, laughing and talking. We came upon a lady who had a flat at the intersection of Ockley and Line. She was struggling to get the jack out of her vehicle. We pulled over and in just a few minutes we had that tire changed. She was so grateful for the help. “Son, what do I owe you?” she asked Cole. Cole grinned his best an aw-shucks grin. “Ma’am, if you will just smile for me and promise me that you will have a good day,” he said, “then we’ve been paid enough.”. Soon the sun started creeping below the horizon and it was starting to get a little cool to be riding around in that Jeep. I asked Cole if he was ready to head back to the house. “Let’s make one more stop,” he said. Cole wanted to go see Coach Ronnie Alexander, his old defensive coordinator at Evangel. As they sat and talked football, I couldn’t help but notice how close they’d gotten. Cole made it a point to let Coach A know he wasn’t going to let his football coaching go to waste. Cole was going back to Austin to fulfill his dreams. After we ate dinner at home, Cole sat next to me on the couch. We watched a movie together. Chase was over at his girlfriend’s house and walked in about the time the movie was ending. I cautioned Cole about staying up too late, because he would have to get up early. I didn’t know until later that after watching the movie with me, he and Chase rented a movie they hadn’t seen since they were kids. They went up into Chase’s room and lay there and watched that movie together. When I think back on all he did that day and the grace and joy he did it with, how he glowed so bright, I wonder if he knew that this would be his last day on earth. If you had only two final days, how would you spend them?. It was still dark when I went into his room at four-thirty and shook him awake. Judy fixed him some peanut butter sandwiches, a bottle of water and a large cup of coffee for his trip. Three times he walked out the front door to head to his truck. Three times he went back in and kissed his mother goodbye. When we finally made it out the door I walked him to the truck, arm-and-arm. As we stood before the truck I once again prayed the Jabez prayer over him. “Oh God, bless Cole indeed and enlarge his territory, that your hand would be upon him, and that you would keep him from evil, that he would cause no harm!”. When I finished I kissed him. “Son, you go back to Austin,’’ I told him. “You bless God and He will bless you.”. “Dad,” Cole said, “I love you so much.”. Cole climbed in the cab and started the ignition. He looked at me and smiled. Then he backed up down the driveway, popped it in drive and headed toward the front gate of the community. Normally when I saw my son off to school, after the truck went out of sight I’d turn and walk back into the house. That morning, for reasons I couldn’t then understand, I walked out to the brick mailbox at the end of the drive and stood rooted. I just stood there and listened to the loud pipes on his truck as he roared down Willowridge Boulevard to Lakeshore Drive and out to Loop 220, which would start taking him back to Austin. The roar seemed to go on forever and ever and ever. When it finally faded, I turned and walked back to the house. Looking up, I noticed Judy standing at the door, tears in her eyes. She had been listening too. It’s funny. You suffer through something like losing a son and sometimes it’s the little things you think about. Cole didn’t have his cell phone with him this day. I think about what difference that could have made. Usually I would call him three or four times on his trip back. Usually he’d call me three or four times. If he’d had that phone, maybe one of those calls would have come as he sped down a lonely mile of road on Highway 79, just a few miles east of Franklin, Texas. Even today I’ll pick up my cell phone, punch forty-four – his uniform number — on the speed dial and hit send. It was approaching ten o’clock Monday morning. I knew he would be getting there close to the time of the meeting but I had told him to try and give me a call when he got to Austin so I would know he was okay. Ten o’clock came and went. I thought maybe he had just gotten there in time to get to his meeting and didn’t have time to call. I went through the normal day, thinking about him, worrying about him, but feeling like he was okay. He’d call. About one-thirty, I got anxious. I called Caren’s apartment and left her a message to tell Cole to be sure and call so I would know he was okay. At two o’clock, knowing I should have heard from him by now, I called back and left another message. I was starting to get a knot in the pit of my stomach. A few minutes later, Wanda Allen, my business partner walked in and said one of my sisters called to tell me to stay in the office, that she was coming to see me. I knew immediately then that something had happened to someone in my family. I still did not want to believe that it was one of my children. I called Caren again. Still no answer. I left a frantic message to please get Cole to call, that something had happened to somebody in the family and I was worried about him. I didn’t know what had happened, but please call. My cell phone rang; it was Ronnie Alexander, my friend and Cole’s favorite coach. I told him I couldn’t talk that something had happened to somebody in my family and I was trying to find out who it was and I hung up. What I didn’t realize was that he was on his way to the office too. He and the entire Evangel coaching staff. When I heard them come in the front door of the office, my blood went cold. Ronnie was the first one in my office. His legs buckled and fell to his knees in front of me weeping. He kept telling me how sorry he was. “Was it Chase? Something wrong with Chase?” I asked, thinking because they were in town and had been around Chase, that something had happened to him. They just looked at me. “Is it Cole?” I asked. “Is he dead?” I screamed. They couldn’t even tell me. I picked up the phone and called Judy. I said, “Come to the office now.” Then I dialed the University of Texas. Mack Brown answered the phone. He was weeping uncontrollably. “Tell me my boy is there next to you,’’ I said, hoping against hope. “They’re trying to tell me he’s dead. Tell me he’s standing there next to you.”. “I wish I could,’’ Mack said and he began crying. “Marc, what do you want me to tell the kids?” he said. I thought about what Cole would want me to tell the kids. “Coach,” I said as steadily as I could, “just tell them I love them.”. Was this God’s idea of enlarging Cole’s territory? What kind of God would do that to this boy? Why would God do this to me? I had been doing what I was supposed to be doing. Cole had been doing what he was supposed to be doing. Why did God let us down? Cole Pittman may not have been a perfect person, but Cole Pittman was the perfect son. For the first time in my life I was facing something that I just didn’t know how to handle. I just wanted to be alone. I walked out of the office and walked out toward the warehouse, trying to get myself together. As I wandered in circles a sudden, strange peace began coming over me. I began to understand. God didn’t take Cole. God needed Cole more than I did, more than this world did. At that moment God and I came to an agreement. God told me that if I honor Him, He will honor this boy. He’ll bless him. He’ll enlarge his territory. A police car sat in the driveway. It was then I saw Judy turn into the driveway and get out of her car. The coaches and the policeman had followed me outside, keeping their distance, when they saw Judy drive up. When she got out of the car, I was perhaps forty yards away. She took one look at me and started backing up. She started screaming. “No, I don’t want to hear this. Get away from me.” Judy started running down the street, screaming. She ran into the middle of the vacant lot and collapsed. The coaches had run to her side to comfort her. I was still mad as hell. I walked up to her and screamed. The University of Texas had already put black stickers with the initials CP on their helmets and kept Cole’s locker just the way he left it. The school started a scholarship endowment in Cole’s name and deemed that nobody would wear number forty-four until Cole would have graduated. Mack Brown wanted to do more. 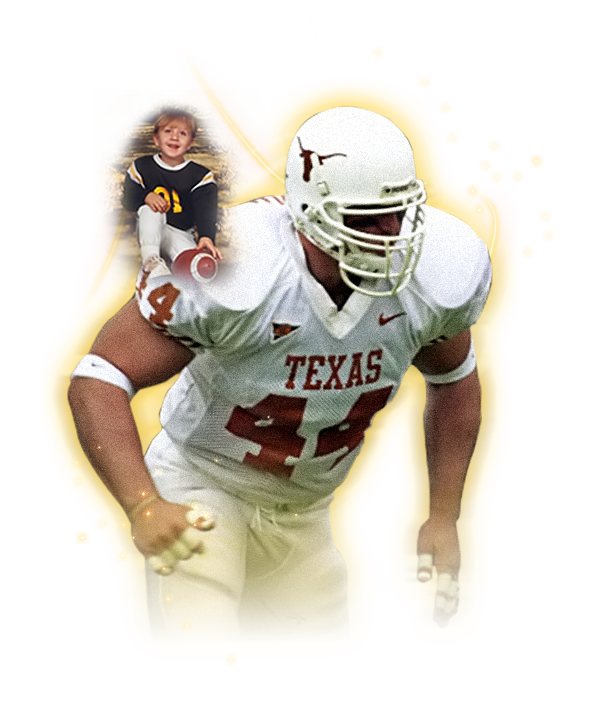 He wanted to honor Cole with a special ceremony before a home game so they selected Sept. 8, 2001, a day the Longhorns would be playing Mack’s former team, the North Carolina Tar Heels. We were honored, but we had a bit of a logistical problem. Evangel was scheduled to play a night game in Monroe, about two hours East of Shreveport. Kickoff for the North Carolina was set for eleven o’clock in the morning. Mack, worried about an all night drive, arranged for us to catch a plane in Monroe and fly to Austin. It wasn’t easy, because Chase was considered a potential recruit and the NCAA has strict rules about paid visits. But Texas, through some lobbying with the NCAA, came through. I could tell it was going to be a special weekend when we got to Monroe. There was a solitary cloud in the sky, and it was shaped like a Longhorn. Evangel dominated the game against Ouachita, building a forty-point halftime lead. Our starters never saw the field in the second half. Flush with victory and a little on edge over what awaited us at Royal-Memorial Stadium, we boarded the plane to Austin. Mack had made arrangements to have us picked up at the airport and carried to the Capitol Marriott, the team hotel, where the next morning we had breakfast with the team. We began to try to prepare ourselves for a day of mixed emotions, but that was impossible. When we walked out the tunnel and onto the field there were eighty-three thousand fans cheering and waving. Before the game Mack gathered the team around Judy, Chase and me and presented us with a framed jersey and the scrapbook that one of the Texas Angels support group prepares from the day that a scholarship football player arrives on campus until the day he graduates. They had a special surprise: Cole’s “T” ring. A “T” ring is a treasure coveted by Longhorn athletes and given only to those who earn their degree. They had made an exception in Cole’s case. On the JumboTron they showed video of the speech he made when he committed to Texas, right down to the end where he said it wasn’t just about football but about promoting Jesus Christ. I later heard from a couple in Tennessee, watching the presentation on television, who accepted Jesus after listening to that video. Texas kicked off, held the Tar Heels on downs but then had to punt. When North Carolina got the ball back their quarterback tried to hit a quick slant. Texas defensive coordinator Carl Reese called a stunt that had end Cory Redding dropping in coverage. Cory was one of Cole’s best friends. One night in Dead Man’s Talk Cole had talked to me about some of the personal problems that Cory was dealing with. I don’t think Cory will ever know just how much Cole loved him. Cole cried on the phone that night because of what Cory was going through. Since then, I’ve kept a close eye on Cory. I don’t think Cory knows that I see some of the things that he still does to commemorate my son, from kissing the CP sticker on his helmet to putting his finger on the CP and pointing to the sky after a big game. Cory has touched my heart forever. The North Carolina quarterback, confused by the stunt, threw the ball right to where Cory was standing. He intercepted it and raced down the sideline as the quarterback, who had the angle on him, came over to cut him off. Not knowing how athletic Cory is, the quarterback went for his legs. Cory expected that from a quarterback. He simply somersaulted over him, leaving the ground at the four-yard-line and landing flat on his back in the end zone. It was almost surreal how many of Cole’s closest friends played a big part in the game. With UT leading 38-14 late in the fourth quarter, linebacker Reed Boyd, a good old country boy like Cole who came to Texas in the same recruiting class, intercepted a Tar Heel pass. Texas drove down the field. With 36 seconds left, another buddy of Cole’s, Brett Robin, dove over for a touchdown. I was excited as anyone with the prospect of a big win on such a special day. I was so caught up in the festivities and emotion that I had no idea what had just happened. I didn’t even look at the scoreboard. Thank God Chance Mock did. Chance was Cole’s best friend. After Cole died, Chance wore the old hunting jacket that Cole used to wear. It was too big for a little ol’ quarterback but he wore it anyway. I wanted it back but I didn’t have the heart to ask him for it, because Chance meant so much to us, too. Cole would call us at nine-thirty every night. When Cole died, it was Chance who would call at nine-thirty every night. Aside from being Cole’s suitemate, Chance was also the Longhorns’ third-team quarterback, which meant he was the guy standing next to the coaches charting plays. After the touchdown he made a beeline for Mack Brown. As the extra point team trotted on the field he pointed at the scoreboard. Mack understood. Under Texas it read “44.”. Major Applewhite stepped under center, got the snap and took a knee. All around us fans turned to us and held up both hands, each with four fingers extended. It would end at 44-14. After the final gun we headed down to the field. Weeping, we hugged every player and every coach we could. The players surrounded Judy and Chase and me as we walked back across the field to the locker room. It took Mack a few minutes to get the players settled down so he could give his post-game speech, but then he presented us with the game ball. I told the players that beating North Carolina was one NC for Cole Pittman. Let’s get one more NC before the season ends. I didn’t have to mention that NC stood for National Championship. Judy was so emotional she could hardly talk. She just told the players how much she loved them. Chase pointed at the football team. “I’ll see you in January,” was all he said. He was going to follow his big brother to Texas. We hugged everyone in sight and then it was time to head back to the hotel. Mack had arranged a car for us but the Texas fans had been so great we just wanted to walk back through their midst, thanking as many of them as we could. They surrounded us. We hugged some more. We autographed programs they presented to us. I wanted to stop at the tailgate party sponsored by Hornfans.com, a fan-based UT website that had been so supportive of us. The owners, Katy and Robert Agnor, had been instrumental in helping us raise funds for the Cole Pittman Memorial Fieldhouse at Evangel, and we wanted to go by and hug them and let them join in our celebration. Robert was behind the grill, cooking for the fans. Tears ran down his face as he hugged me and kissed me. We would have stayed forever but we had a dinner date and time was running short. We still had a good half-mile to walk so I decided we needed to catch a cab. I stepped out to the street and there was a yellow minivan taxi. As we climbed into the back seat, exhausted, the cab driver started a conversation. “Man, how about forty-four points for number forty-four, Cole Pittman,’’ he said excitedly. ”What an awesome kid this must have been.”. I knew this guy hadn’t been to the football game so he must have been listening on the radio. “Wasn’t it awesome,” I said. He looked back over his shoulder and sized me up. “You look like you may have played football. Are you a parent to one of the players? Have you ever met this guy, Cole Pittman?”. I nodded. “We are his parents,” I said quietly. The man started weeping. He wept all the way back to the hotel. The last thing he said was, “I only wish I could say for sure, I had given an individual like Cole Pittman a ride one time.”. I tried to give him his fare. He wouldn’t take it. I had to leave it there on the backseat. That taxicab driver will never know how much he blessed us that day.